Restaurant wine lists can be as lengthy as a novel, which makes ordering the right bottle a bit overwhelming. But what if the restaurant has teamed up with an area winery to produce a bottle specifically designed to pair with the food? An easy choice for the consumer and an even better decision for the restaurant. Here are few such partnerships that are doing it right. Located in The Nines Hotel, Urban Farmer takes its name seriously. The restaurant grows its own mushrooms, cultivates its own indoor/outdoor vegetable gardens, raises bees for honey and so much more. 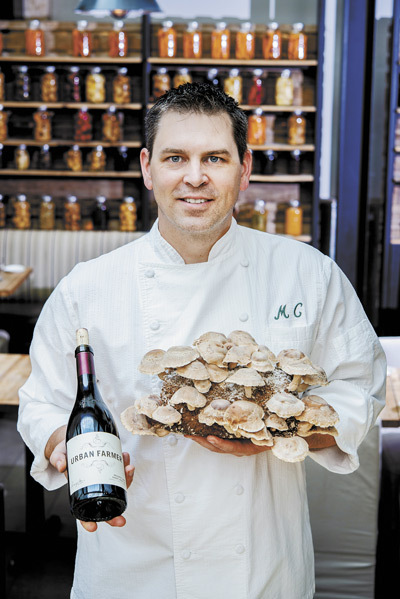 In fact, it seems the downtown Portland restaurant is always experimenting with how to take their culture of cultivation to the next level, which includes a house wine with a local winegrower. The partnership started from a connection Brown had with Angela Estate general manager Jessica Endsworth — the two had met years before when she was a portfolio manager for Moet. Together, Urban Farmer and Angela Estate started its successful partnership. 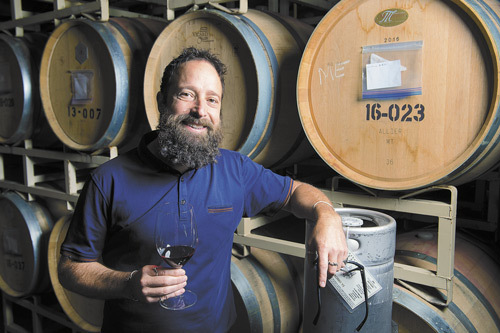 Under the leadership of winemaker Ken Wright, with fruit from Angela Vineyard in the Yamhill-Carlton AVA, the two companies crafted a private label Pinot Noir. The 2015 house wine includes three clones; chefs and general managers from every Sage property joined together to participate in the blending trials. The end result is now the signature wine. 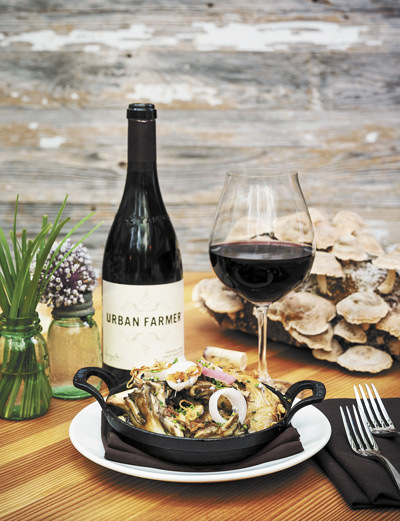 As for its quality and characteristics, taste for yourself — by the glass ($21) or a bottle ($84) — at Urban Farmer or Departure, located on the rooftop of The Nines. Although not the first in Portland to make wines in partnership with local restaurants, Cana’s Feast has certainly been a leader. The winery’s model is a bit different than other brands. 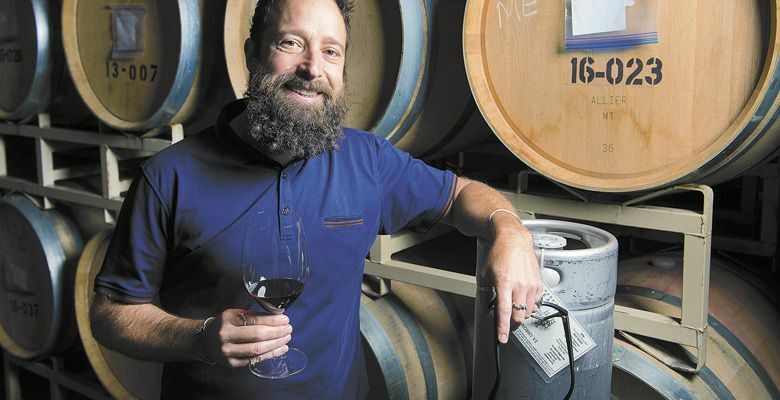 Instead of bottling and labeling private wines, the Carlton-based producer works with specific restaurants to craft a special blend to be placed in a keg, creating an affordable, approachable and sustainable glass pour. With the advantage of working with a range of varietals, Cana’s Feast has successfully cultivated valuable relationships in the city’s restaurant and bar industries. Winemaker Patrick Taylor humbly suggests they were simply filling a niche. He attributes the success of his keg program in part to living in Portland and growing connections through his vermouth brand, Hammer & Tongs. Benefits abound. Not only does the restaurant offer a custom blend ideally suited to its specific palate and menu items, but also a story — of local proprietors joining forces to create a hand-crafted product — to be shared with guests. There’s also a green effect: The keg program ultimately means reduced waste, both packaging and product. Over the years, Cana’s Feast has partnered with a number of marquis spots in Portland to make some memorable wines: Il Cavallo Rosso, a super Tuscan-inspired blend served at Oven & Shaker; La Mastina, an Argentine-inspired Malbec/Cabernet Sauvignon blend offered at Ox; Rookery Red, a southern Rhone-style blend on the list at Raven & Rose; and Arêt’Est, a Left Bank-inspired Bordeaux-style blend at Irving Street Kitchen. The Hi-Lo Hotel also sees the value of relationships. 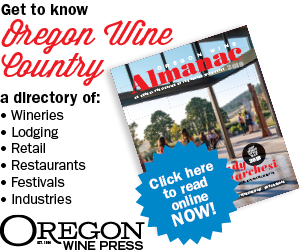 They’ve partnered with Chehalem Winery to create both a Pinot Gris and Pinot Noir to serve in the hotel’s bar, Lo Bar, and the hotel’s restaurant, Alto Bajo. In addition to the wine, the hotel offers 15 Hi-Lo-branded local products, including cider and beer, making it easy for guests to not only enjoy everything Oregon, but also bring Oregon home with them, too. The Hi-Lo wines utilize each of Chehalem’s three vineyards. In fact, these wines not only represent the best of all three locations but also represent the vintage. In the end, it’s about balance in creating the final product. Depending on the year, specific sections of the vineyards are used to bring different balances of sugars and acids. The Hi-Lo Pinot Gris is made in stainless steel, and each vineyard site is fermented separately in order to fine tune and balance accordingly. For the Hi-Lo Pinot Noir, the winery selects a barrel from each site. Hi-Lo staff then tastes the three different wines, choosing what they prefer and think will pair best with the menu. At Alto Bajo, Chef Bryant Kryck draws inspiration from chefs, cooks, families, parents, co-workers and life experiences that have made a significant impact on his life — and his cooking — while staying true to traditional Mexican-inspired cuisine. 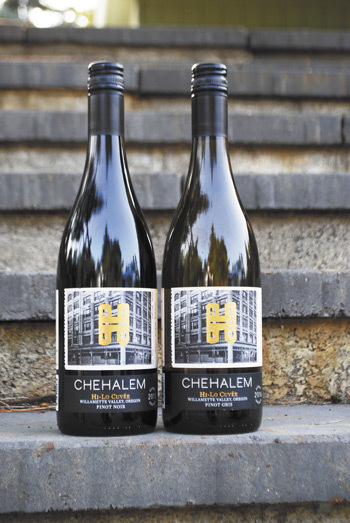 His menu always includes touches of seasonality and locality, making the Chehalem Hi-Lo wine a perfect pairing. Prepare garlic purée: Simmer garlic in butter until fully soft. Pass through ricer, saving puréed garlic separate from garlic butter. Store both in refrigerator. This recipe only uses the purée. Prepare pickled shallots: Peel and cut three shallots into thick rings. Boil pickling liquid (1 cup each vinegar, water and sugar, plus 1 tablespoon salt). Pour over shallot rings. Store in refrigerator until needed. Prepare fried shallots: Peel and slice remaining shallots into thin rings. Fry in canola oil until golden brown. Remove from oil; season with salt. Reserve at room temperature in dry place until needed. Put it all together: Add garlic purée into mushroom mix and remove from heat. Fold in garlic chives. Place in serving vessel and garnish with the fried and pickled shallots, and any other flower or herbal treasures gathered from your garden. In blender, combine oil, onion, garlic, rosemary, salt and pepper; purée until smooth. Generously coat lamb chops with marinade and chill, covered or wrapped tightly, for at least 4 hours and up to 24 hours. Before grilling, let meat rise to room temperature, about 30 minutes. Meanwhile, prepare a grill to medium heat. Season chops with more salt and pepper, and transfer to grill. Cook, turning once, until both sides are golden brown and meat is cooked to medium or medium-well, about 12 minutes total. Remove. Let rest for 5 minutes before cutting. Serve on bed of rosemary sprigs. Garnish with sliced radish and flowers, if desired. Make rhubarb al pastor: Dissolve achiote in 1 cup vinegar. Set aside. Make rhubarb purée. Set aside. In food processor, combine achiote, rhubarb purée, agave nectar, onions, lime juice, garlic, oregano, cumin, and salt and pepper to taste. Purée until well-blended; it should not be grainy or gritty. Set aside. Lay half of banana leaves on sheet pan. Lay salmon on top of banana leaves; add salt and pepper to taste. Cut butter into small cubes and place around and on top of salmon. Scatter diced shallots on top. Pour rhubarb al pastor over salmon, making sure to get sauce under salmon as well. Wrap more banana leaves over top of salmon and tuck underneath. Preheat oven to 350°F for 15 to 20 minutes. Bake salmon. I recommend a medium-cooked salmon internal temperature of 120°F. While salmon is cooking (or before), slice pineapple and char on grill until slight black grill marks appear. Remove salmon from oven. Cut open banana leaves with scissors; be careful of steam. Place raw banana leaf on serving plate and carefully place salmon. Garnish plate with grilled pineapple and rhubarb twirls (made by slowly peeling rhubarb with peeler into long, thin slices). Optional: Impress guests by adding edible flowers and micro-greens. Make it a meal and serve with tortillas, rice and charred corn.